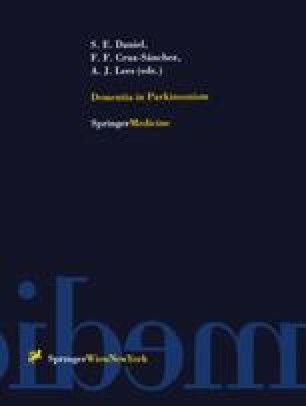 Cerebral cortical Lewy bodies occur in a spectrum of clinical syndromes including Parkinson’s disease (PD) with and without dementia, and dementing conditions clinically resembling Alzheimer’s disease with few or without parkinsonian features. It is unclear whether these conditions are variants of one disease process or represent pathogenetically distinct entities. Here we compared the cortical pathology in post mortem brains of three groups representing the predominant clinical phenotypes of Lewy body disease, including 27 non-demented cases of PD, 23 demented PD cases, and 11 cases of Lewy body disease who initially presented with dementia and showed only limited features of parkinsonism during the course of their illness. In addition to neuropathology, computer-assisted histoblot analysis was used to assess cortical amyloid ß-peptide deposition. There was wide overlap of the pathomorphometric features between the two groups of demented cases. It appears that substantial cortical Alzheimer-type pathology present in most demented cases contributes significantly to the development of dementia in Lewy body disease.